The refugees from the “other-side” filled up Delhi and many small towns in 1947 all around Delhi , mostly in Haryana , Punjab and Western UP . They mixed with the leather , brass artisans and created the now famous Agra and Moradabad small industry clusters , providing employment and much needed export earnings , while building scale . They also were responsible for the auto components clusters around Maruti-Suzuki and Hero-Honda after first learning to build global scale cycle industry like Atlas , Hero , Avon . The MSME sector did what the PSU sector couldn’t , provide employment. The fact is that mostly PSU sector is heavy capital intensive and not employment creating . “According to numbers from the ministry of heavy industry and public enterprises, the total number of personnel in central public sector enterprises fell by 4.2% in 2015–16 to 15.21 lakh from 15.87 lakh in the previous year. In the previous year, the decline was to the extent of 6.2%. The total number of PSU employees fell by 1.04 lakh in that year to 15.87 lakh. So the total Central PSU employ less than 1.5 million people of more than 500 million working population. “ As per National Sample Survey Office (NSSO) on labour force survey, the number of estimated employed persons in 2011–12 on usual status basis were 47.41 crore, of which 82.7% of workforce (39.14 crore persons) was in unorganized sector. The share of self-employed, regular wage/salaried employees and casual labour were 52.2%, 17.9% and 29.9%, respectively in the total workforce of the country. That means a little less than two of ten workers are employed in organised sector, who are drawing salary and getting regular social security and employee benefits. The 10 odd million people in organized manufacturing amount to nothing much , less than 2% of our working population. It’s the unorganised sector that provides employment. That is almost 60 million. Then there is farming . So with increasing automation , robotics et al , it’s not the organized industrial sector that provides employment or will provide ever in the future. We just have to nurture labour intensive production with better quality processes , more capital support , design , branding , marketing at the level of clusters . Create platforms that build better working conditions and wages . This is where the real battle is , which not a single political party gets . It’s easy to ask for cashless via demonetisation and be on the formal reporting system via GST , but without hand-holding , without sensitivity to the needs of the informal sector things ain’t changing . From the 1980’s I have been hearing that India is like a cake with icing on the top , and that icing gets nothing about the reality of the cake. The western worldviews of an AI , ML , autonomous driving vehicles and robotic arms is a fantasy added on top of the icing . It has no reality to 95 percent of India. And it’s a matter of time , that India rejects the whole icing , if they keep their imagination towards the west . Giving a context to the video shared below , created by a features website based out of Japan . “Sports Goods Manufacturing Industry in India originated on 13th April, 1883 at Sialkot (Now in Pakistan).Sardar Ganda Singh Oberoi found a vision to start this industry who founded Oberoi Limited in Sialkot and made first export of sports goods to England in May 1884. When India was partitioned in 1947, many of Sialkot’s skilled Hindu craftsmen migrated across the border into Punjab, settling in Jalandhar and Meerut, where the Indian sports goods industry is now based. Since the craftsmen were settled in these areas, the entrepreneurs started pouring in Jalandhar and Meerut and thus started the present Indian Sports Goods Industry in 1948 precisely. The Indian sports goods industry manufactures 318 items. However, major items that are exported are inflatable balls, hockey sticks and balls, cricket bats and balls, boxing equipment, fishing equipment, indoor games like carrom and chess boards and different kinds of protective equipment. The Indian sports goods industry is a highly labour intensive industry which provides employment to the weaker sections of society and also employs a large number of women. Indian sports goods industry is in its nascent stage, though over 100 years old and some of the manufacturing centers over the years have established in and around Jalandhar, Meerut, Delhi, Mumbai, Agra, Moradabad, Chennai, Jammu and Calcutta. Of these, Jalandhar and Meerut together claim around 75% to 80% of the total production. With what started as a struggle of few entrepreneurs and their workers transplanting their roots to a new place, Jalandhar and Meerut sports goods cluster has emerged as a major manufacturing center with forward and backward linkages along with local associations and institutional support. There are about 250 exporting units, around 1000 manufacturing units for domestic markets, and some 4000 micro enterprises. In addition, there are around 20,000 household units located in and around both the city. Together these MSMEs employ around 1 lakh workers directly or indirectly. The turnover of this cluster is approximately Rs 2000 crores (unofficial figure) catering to domestic and export markets. Even years after its establishment, not many improvements have been seen in its operational and other business related activities. The cluster is afflicted with problems of outdated techniques, near absence of standards and quality of the products as well the processes; acute shortage of some of the raw materials; unavailability of skilled labor. The demand for sports goods is increasing in international as well as the domestic markets and this cluster holds the potential but lacks the technical know how. This video is about a village near Meerut . “ The city in Uttar Pradesh is home to 15 top brands in sports equipment, including table tennis, weightlifting, sportswear, gymnastics, weight training and fitness. The value of sports goods exported in 2017–18 was Rs 1,079 cr, according to the commerce ministry. The All India Sports Goods Manufacturers Federation says 60% of the sports goods made in India are exported, which pegs the sector at approximately Rs 1,750 crore. Meerut alone has 45% share of the export market. There are roughly 3,000 units in the city, employing around 25,000 workers, according to industry estimates. The industry, comprising mainly small scale units, employs around 500,000 people around the country. Meerut has over the past few years seen the emergence of top brands that are making a global impact in athletics and track and field gear, table tennis and niche fitness equipment, including gear used by athletes, says Amber Anand, director of Nelco Sport. 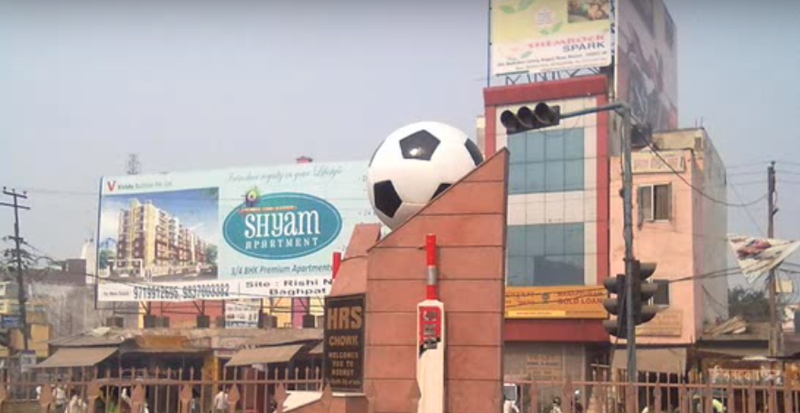 “Meerut is already the world’s top cricket bats manufacturing hub and companies here have been able to use the brand advantage to enter other niche products and make a mark.” Jalandhar in Punjab, which is an older sports goods hub in India, employs more people but the manufacturing sector has remained unorganised. “Jalandhar is the hub for manufacturing balls and inflatables, but it is losing ground to different countries, including Pakistan and China. But diversification won’t be of any use unless the sports goods companies in Meerut can reinvent themselves, say experts. Most companies here are old family-run entities. This makes the managers risk-averse, says Dharam Mahajan, chairman of Meerut-based Sports Goods Export Promotion Council.